The slip stitch (abbreviated sl st) is the flattest (or smallest) of all the crochet stitches. Although you can use the slip stitch to crochet a fabric, the slip stitch is really more of a utility stitch or a technique. Practice this stitch by slip-stitching the ends of a foundation chain to form a ring. 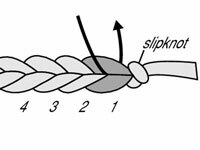 1Make a chain that's 6 chain stitches (ch 6) long. Don’t forget to begin with a slipknot on your hook. 2Insert the hook into the first chain you made, forming a ring. 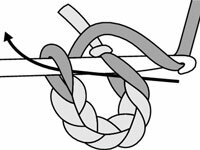 The first chain stitch is the one farthest from your hook. If you don’t want to form a ring, then insert the hook into the second chain from your hook. 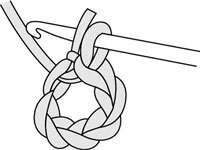 3With your yarn hand, wrap the yarn from back to front over the hook (yo) and with your hook hand, rotate the throat of the hook toward you. 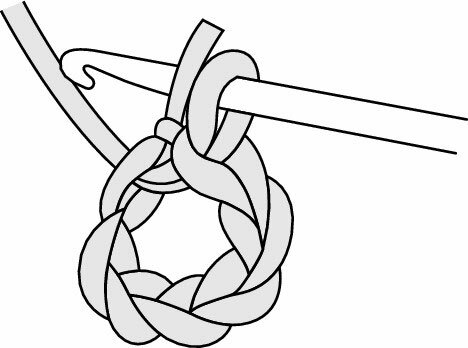 This step positions the hook and yarn to form the stitch. 4While applying gentle pressure upward, draw the hook with the wrapped yarn back through the stitch and then through the loop on the hook in one motion. One slip stitch is complete, and one loop remains on your hook. No matter where you work the slip stitch, you always do it the same way, whether you’re making a seam, shaping your work, joining a new ball of yarn, creating a ring, finishing the edges of your work, embellishing crocheted fabric, or forming combination stitches.